Development Horizons by Lawrence Haddad: Inclusive capitalism: what can the rich countries learn from other nations? Inclusive capitalism: what can the rich countries learn from other nations? 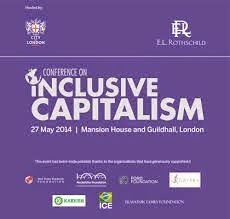 Yesterday the City of London Corporation ("the world's leading international finance and business centre") co-hosted a big conference on "Inclusive Capitalism". At its heart inclusive capitalism seems to be about relying on the morals of the rich to do something about inequality. The onus seems to be on the banks and CEOs to change "mindsets" (see this article by Mark Boleat, chairman of the City of London policy and resources committee). Remind anyone of Corporate Social Responsibility? Frustration number one. It seems to me that the only way to generate inclusive capitalism is to change the rules of the capitalism game and to focus on reducing inequality via fiscal policy. In March of this year the Bank of England appointed Nemat Shafik its Deputy Governor for Markets and Banking. Minouche, as she was known when the Permanent Secretary at DFID, will hopefully bring some lessons from international development to the UK and rich country scene. What might they be? 1. Treat financial sector wealth in the way one would treat other potential "resource curses". We know how to regulate oil and mineral wealth so that they generate inclusive growth rather than exclusive growth. Learn from these experiences. 2. Make everyone in the Bank of England read Ha Joon Chang's "23 Things They Don't Tell You About Capitalism". Excerpt: "The free market doesn’t exist. Every market has some rules and boundaries that restrict freedom of choice. A market looks free only because we so unconditionally accept its underlying restrictions that we fail to see them." The type of capitalism we get is a political outcome, one that is shaped by rules hammered out by competing interests. There are many "capitalisms" around the world--it is time we looked outside the West for some inspiration and ideas. 3. Make fiscal analyses more equity sensitive. In development economics we worry a lot about the distributional aspects of who are taxes raised from and who are they spent on (Public Expenditure Reviews). This kind of analysis does not often puncture public consciousness in the rich countries. 4. Invest in education and health. Boring, I know, but yet another article (this time in Science) notes the net value of a higher degree in the USA to be $500,000 over the life course. Investing in inclusive education (early child and higher education --not only the stuff in-between) and health (maternal and early childhood again) is an incredibly sensible way of making capitalism more inclusive, no matter the set of rules it is governed by. So the next time you hear someone going on about inclusive capitalism, ask them what they would do if they were in charge. If you work in international development, you might even have some new ideas and evidence to share.